As discussed yesterday, the reason massage wax candles work is because soy wax has a very low melt point. This means that you can pour the melted wax directly from the candle onto your hand with comfort. The wax is not much warmer than bathwater. Of course, just to be on the extra safe side, always pour the wax into your hand and not directly into the small of someone’s back. Straight 100% container soy wax doesn’t work very well for a massage. This is because when the candle cools off, it still turns into a wax. And, wax doesn’t work well for massage. So, by adding extra oils, you can make a very emoliant massage candle. We tried many recipes before coming up with the three that we’ll go over in the next few days. But first, some basic safety and starter tips. Ingredients Listing – Since these are meant to use on the body, they fall under normal labeling rules with skin products. Full ingredients must be listed using either common names or INCI names. Ounces and place of manufacture must be listed. Skin-Safe Ingredients– You cannot use candle fragrance or color for massage candles. All items used must be skin safe. 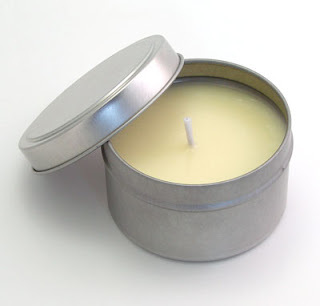 Bramble Berry Container Soy Wax is skin-safe and can be used for massage products. Not all soy candle wax is safe for use on skin so be sure to double check with your vendor if you’re not using a Bramble Berry wax. The skin safety requirements mean that you can only use colors approved for burning (no micas, no Labcolors) and for skin. That leaves only a few color options and really, do you want to have a colored massage anyways? In order to start this project, you will need NatureWax C-3 blend (all natural soy skin safe wax), a skin and candle safe fragrance (all of the Bramble Berry soap fragrances can be used in soy candles), a tin or candle container and an appropriately sized wick. The only equipment needed is just a Pyrex container and a spoon. Tomorrow, we’ll go over the first easy recipe. It only contains four ingredients so it’s the easiest of the recipes to make. Or maybe even candelila wax can be used since that has a melting point of around 68-70 something degrees? I would love to make some of the massage candles, but can’t find the recipe, I’m a little behind i finding this site, but am trying to catch up fast. Does anyone still have the link or recipe? Candles really works wonders for the house. I always have them depending on what I do. Sometimes even just when I'm about to sleep and of course, when taking a good bath… at times, when I use some massage electronics or if I have a masseuse, I light some candles too as they help in giving you comfort. 2 Virgos, Thank you for that suggestion. That’s such a good idea! I appreciate you sharing. Tinamarie, those Flying Pig molds are adorable, aren’t they? Excellent article, recipe and intro. To avoid the wick problem I’ll be making soy wax massage tarts. This sidesteps the issue of people burning themselves on the flame, a safety issue that has many chandlers avoiding making this wonderful and popular product. Thank you for the prompt reply, Anne-Marie! I think I understand sizing of wicks now, but I am still uncertain about which types of wicks are best used in different soy candles. Could you perhaps discuss the different types of available soy wicks, and why it is best for your recommended application? Thank you very much! By the way, your Flying Pig molds are one of my biggest sellers! Have you seen this little wick tutorial? Thank you for offering these excellent tutorials, Anne-Marie. Would you PLEASE discuss wicking in detail? I do not understand the best types of wicks to use for soy candles and massage candles, and why that particular wick is recommended. Thank you again!